A hotel is not just the place you retreat to after a long day to kick your feet up and relax. On the contraire, a hotel can sometimes be the destination itself, affording you an unforgettable experience, especially when it’s providing stunning views and Instagram-worthy backdrops. Trust us, you will definitely remember the panoramic views from your luxurious accommodation far better than what you found in the mini bar. From the cliffs of Greece, to the valleys of Utah and even the depths of the deep blue, we are bringing you some of the world’s best hotels with iconic views. Paris is the place where opulence knows no bounds, and it’s certainly no different at the famed Shangri-La Paris, offering commanding views of the Eiffel Tower that will leave you in utter awe. Housed within a former royal palace, the hotel boasts 100 elegant rooms, including 37 suites designed to provide a bespoke luxury experience. No matter which quarters you opt for, you will be spoiled by sweeping views of magnificent gardens, cityscapes, or, of course, the “Iron Lady” herself, from your French windows. Relax on your private terrace, sink into your plush bed, or slide into a sumptuous warm bath with a glass of champagne and watch as the iconic monument lights up the night sky. From every corner of the room you will be greeted with an idyllic backdrop that will set the scene for one unforgettable stay. 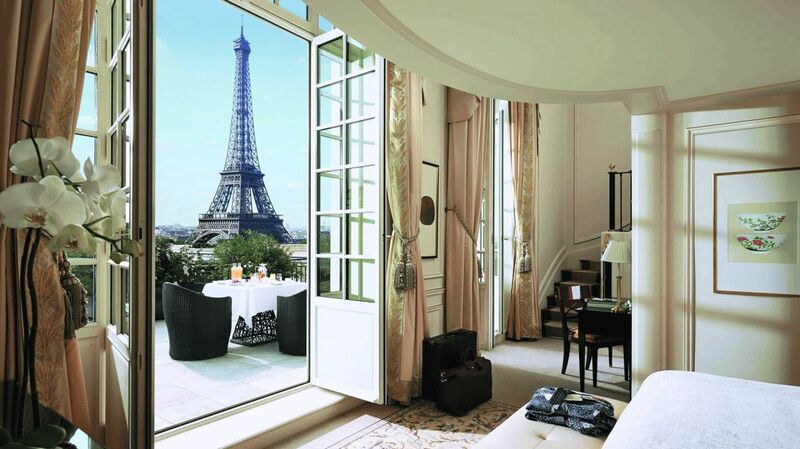 If you are looking for the best hotel views in Paris, the Shangri-La is clearly the winner. If it’s a luxurious hideaway with jaw-dropping landscape views you are after, the Tierra Patagonia most definitely delivers. Overlooking the staggering landscapes of the Torres del Paines National Park, the hotel itself is already quite the marvel, and though you may want to relish in all its architectural glory, it’s Patagonia! The views outside will far surpass anything you could possibly imagine. 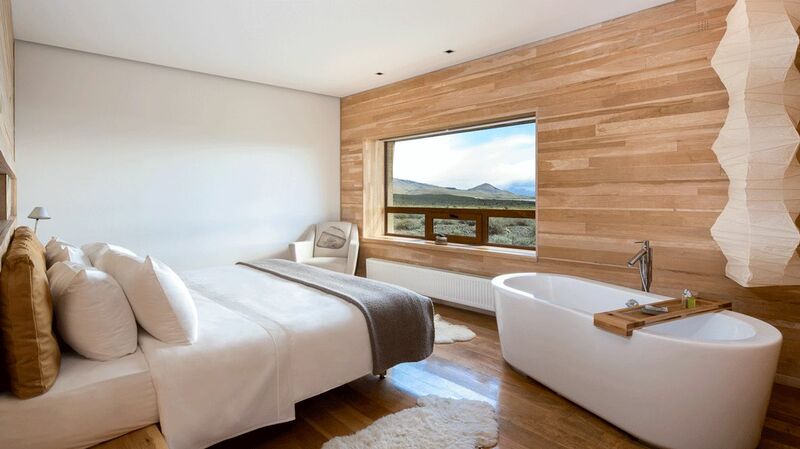 Luckily, the Tierra Patagonia brings the Chilean great outdoors in, giving you a sense of being connected to nature and your surroundings, no matter where you are in the lodge. Whether you are soaking in the outdoor hot tub or the privacy of your own one, relaxing in the common area, nestled in your cozy bed, or swimming laps in the infinity pool, every view from every window offers natural wonders all around you, and you might even spot some llama-like guanacos, rheas and foxes. 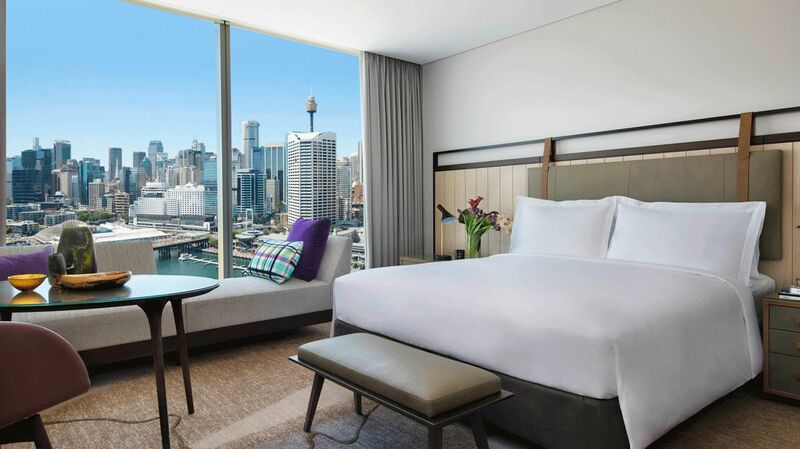 Unwind in the beating heart of Sydney at the Sofitel Sydney Darling Harbour. Hovering at 35 stories high, this gleaming glass tower is the tallest building in Darling Harbor, making it, hands down, the best hotel for great views in the city. Choose from any one of the 590 luxurious rooms and lavish suites where not only the accommodations are five-star, but so are the views. Enjoy breathtaking views of the harbour and skyline from the floor-to-ceiling windows of your beautiful harbourside haven, or as you laze away your days by the infinity pool. For the best views in the house, be sure to book a corner suite, featuring a glass wall wrapping around the space, providing unmatched panoramic views. 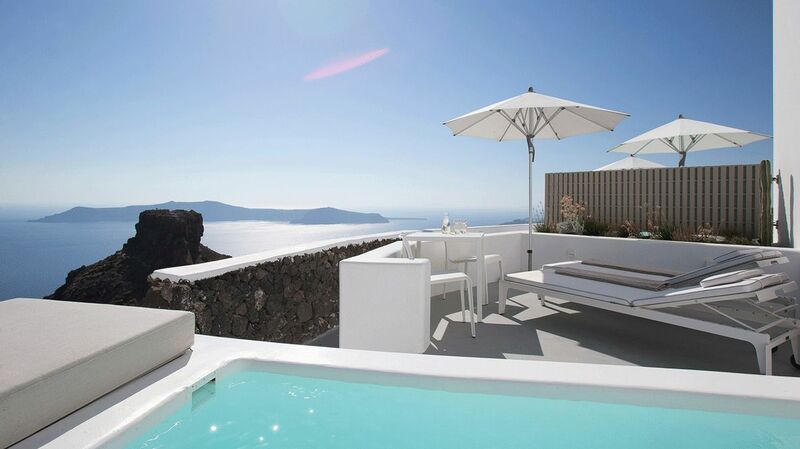 Perched on the cliffside of the island’s northwest rim, overlooking the sapphire waters of the Aegean sea, the Grace Santorini is a stunning boutique hotel with incredible views. Located in the picturesque village of Imerovigli, high above the world-famous Caldera, the Grace provides the perfect vantage point to enjoy Santorini’s emblematic views and sumptuous sunsets so magical they are undoubtedly artistic creations of the mythological gods themselves. Retreat to your villa or suite where you won’t be able to tell where the indoors end and the outdoors begins, with clean lines and natural materials. Soak up the seaside splendor and whitewashed abodes with pops of cobalt blue from your private terrace or heated plunge pool on this romantic escape. The Ritz-Carlton brand is one that needs no introduction. However, when speaking of The Ritz-Carlton Millenia, the Singapore hotel with an iconic skyline view, you should know it has been voted as having one of “The World’s Sexiest Bathrooms” along with an expansive list of other accolades and awards. 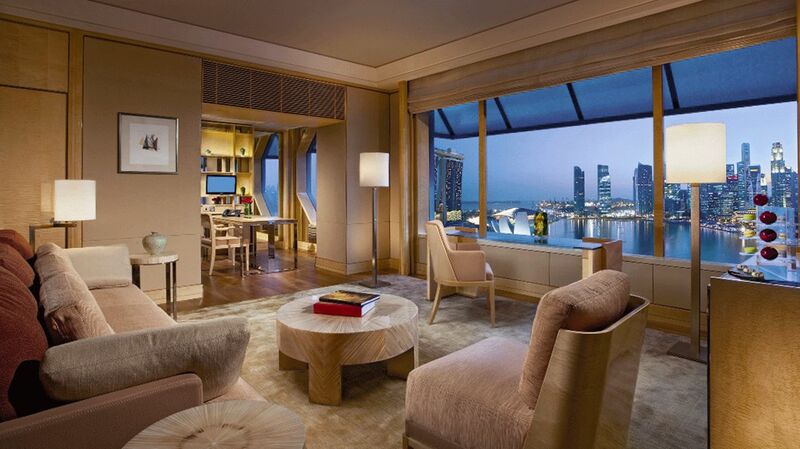 Set in the Marina Bay, the RC Millenia boasts classic luxury and unabashed opulence. Floor-to-ceiling windows stretching from the living room to the bedroom offer a postcard perfect, panoramic view of the bay area. But, the real star of the show is the marble-clad bathroom with a deep soaking tub set by an octagonal window affording you a luxurious spa-like escape as you take in the stunning vistas during a sunset soak. 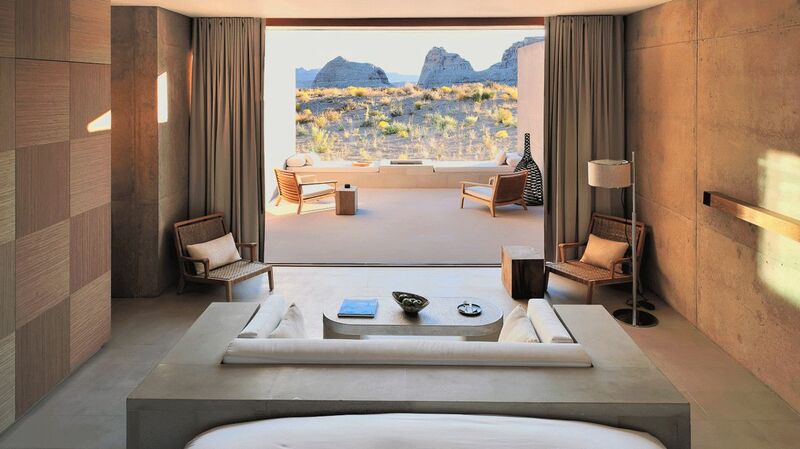 Situated on 600 acres in Canyon Point, Southern Utah, the Amangiri Resort is among the top US hotels with the best views. Situated between the Grand Canyon and Monument Valley, the resort blends in seamlessly with its natural surroundings and offers inimitable views of some of America’s most iconic scenery. The contemporary suites feature a pool, lounge area and sky terrace ideal for taking in the expansive desert views on warm summer nights. In the winter months you can cozy up next to the firepit, or take a warm dip in the jacuzzi under a blanket of stars. Even the 25,000 square foot spa offers uninterrupted views of the surrounding dunes, plateaus and mountain ranges. What better way to shoo away the stresses of everyday life than to disconnect from the world and connect with nature in at adult-only retreat where you can focus on your well being? 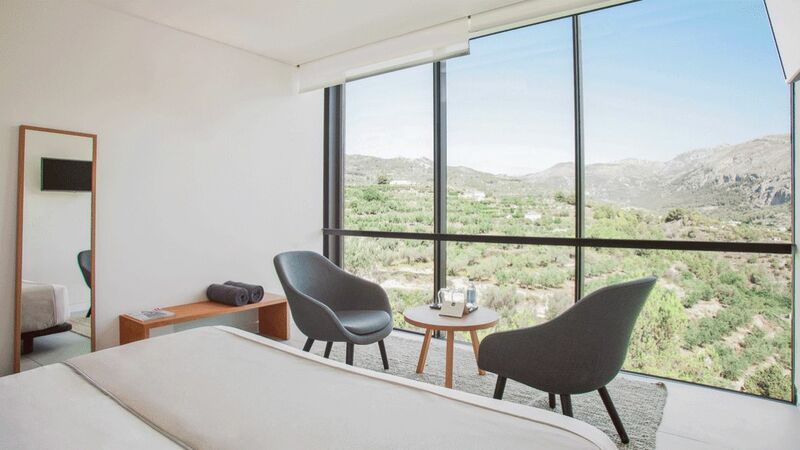 The Vivood Landscape Hotel provides just that, along with magnificent rooms boasting the best views of the Valley of Guadalest. Each of the 25 ultra sleek, eco-friendly rooms are elevated about 3 meters off the ground, enabling you to hover above the famed valley and admire the views of the year-round infinity pool. The rooms reflect minimalist design allowing large windows, facing the rugged landscapes of the valley, to serve as a masterful work of art. You may be able to escape your stresses as you are taking a pampering dip in your private jacuzzi or unwinding at the spa, but you will never be able to escape the views of the sublime surroundings. 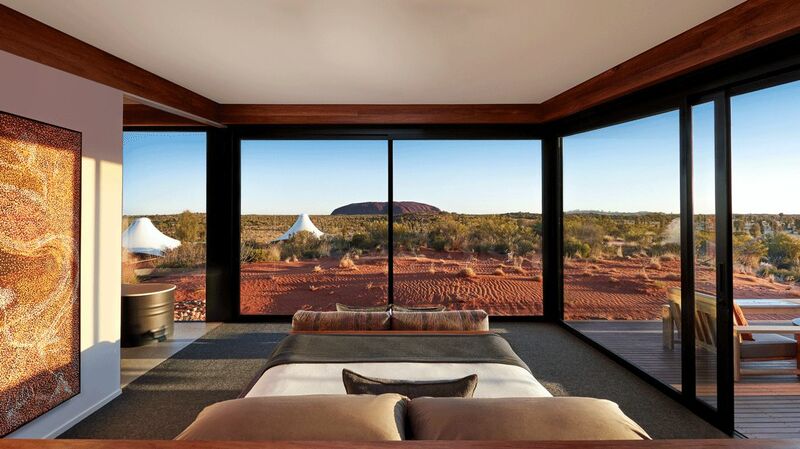 Luxury villa tents, nestled atop red-rust dunes with uninterrupted views of Uluru, Australia’s most iconic rock formation, take camping to a whole new level at the Longitude 131. These stilted abodes hover above the verdant bush and feature a wall of windows to display the thousand-foot monolith, rising from the earth, in the distance. Wake in the mornings and witness the sun rising from the ground, painting the rock an effervescent bright red as if setting it ablaze, all from the foot of your bed. Unwind in the evenings on your private terrace or over a delectable dinner, with a quintessential sunset. Watch as the sun begins to fade, turning the sky into a painter’s palette with hues of blues, vibrant pinks, fluorescent oranges and reds, transforming the rock into a majestic canvas. Trust us, you won’t find a better resort with impressive views of Australia’s natural gem. What is dreamier than sleeping under a million stars in the Arctic wilderness, inside a heated glass igloo? We’ll wait for you to think of something. Give up? Great, because it’s also hard for us to fathom something dreamier than the Kakslauttanen Arctic Resort with its unique accommodations and wanderlust-worthy views. 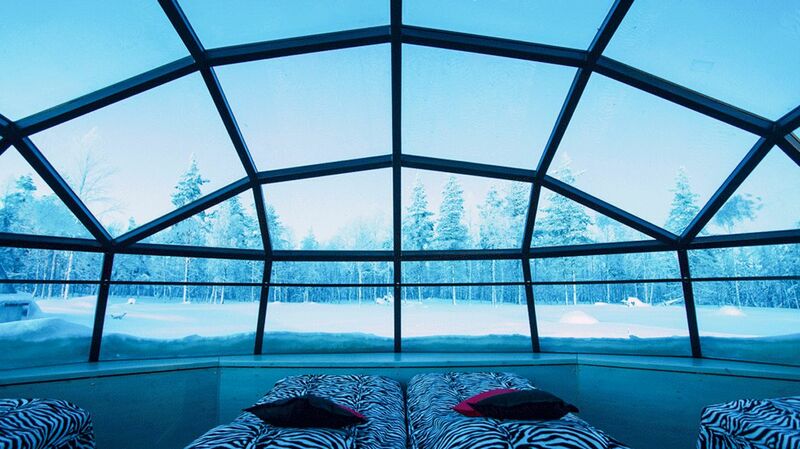 The Kakslauttanen glass igloos are designed to immerse guests in Lapland’s arctic nature and is one of the best places in the world to watch the Northern Lights. Nestle up in the warmth of a thermal glass igloo and get a front row seat of the ethereal display of colors as the Aurora Borealis dances to its own melodic tune in the night sky. The best times to catch this spectacular show are from late August until the end of April. If you are looking for a luxury lodge with stunning coastline views, natural wonders abound and an all around wow factor, the Southern Ocean Lodge is your place. 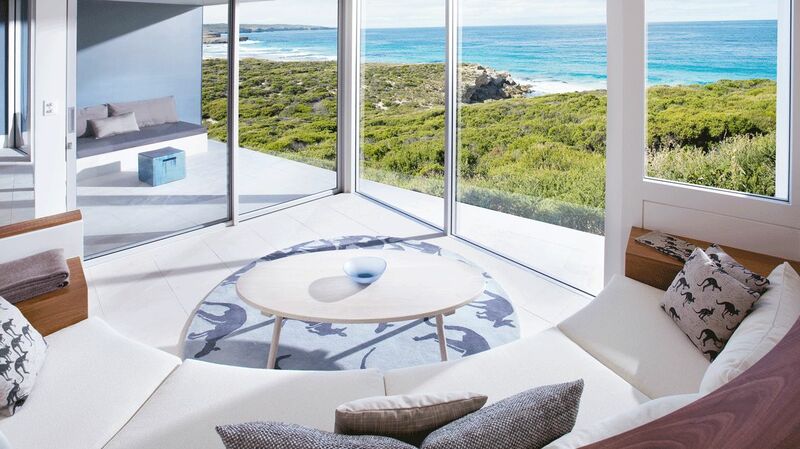 Perched on a secluded cliff with crashing tides below, this resort sports commanding views of the stunning coastline and Kangaroo Island wilderness. Each of the 21 luxe suites feature lavish king-sized beds, a curved sunken lounge, and a dramatic glass-walled bathroom that brings the outdoors in with its fusion of breathtaking wilderness outside and unbridled comforts inside. At any moment you can spot some of the island’s prolific wildlife; such as kangaroos, koalas, seals, sea lions and an assortment of birdlife. This Australian boutique hotel truly offers a unique travel experience and unforgettable views. When you are cultivating your list of bucket list-worthy places to stay with immaculate views, be sure to add The Muraka at Conrad Maldives to the list. 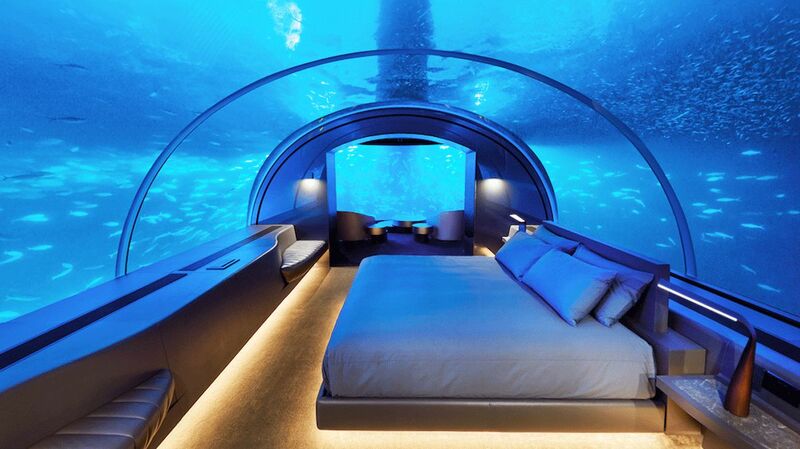 This two-storey villa rests 16.4 feet below the surface of the Indian Ocean and is the world’s very first underwater residence. The Muraka, quite literally, allows guests to immerse themselves in the depths of the ocean, while taking in the 180-degree panoramic views of coral and exotic marine life. Imagine bearing witness to a surreal Maldivian sunset as you are encased in an acrylic dome and falling asleep as tropical fish swim overhead. Wake in the morning as daylight magically seeps through the turquoise blue waters illuminating all that it touches. The mesmerizing view doesn’t just stop in the underwater suite, ascend to the top deck where you will find another two bedrooms, private deck and living room, all overlooking the azure blue waters of the Maldives.